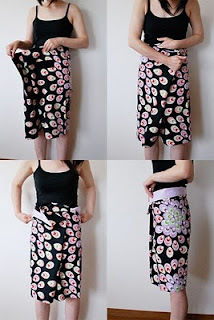 I've made four pairs of those pants in different fabrics as my gifts for four of my friends. I already owned a pair of store-bought short Thai pants, and I basically eye-copied and cloned them. The recipients were the winners of a certain game which I organized, and I wanted to treat them with something funny but something you wouldn't expect to get as a prize. I bought some African wax-printed fabrics that were made in France, sewed them into Thai pants, and suggested the winners to use the pants when they're doing Indian yoga exercises. Very international, don't you think? *This picture is a part of the instructions showing how to put the garment, which I made for my friends. 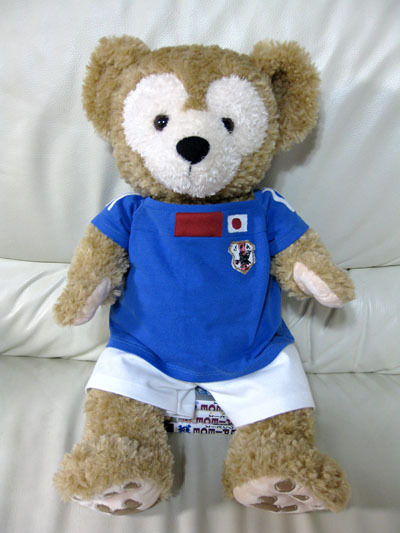 I've made a football costume for my daughter's bear. We visited Tokyo DisneySea and my daughter took her Duffy with her on the day. It might make you think that my daughter is an infant who cuddles her teddy bear all day, but I tell you this, she is a teenager who has no such habit. I know it sounds weird if you don't know what is happening there, but now it's trendy for youngsters to bring back and show off one's own Duffy to Tokyo DisneySea to make the day even more exciting. I think the trend is mentally similar to going to the football match, with wearing the replica uniform of your favorite team to show your passion. So I made a fun of it. **Sadly we lost the game today, but this is exactly how the World Cup is for most nations, anyway. Happy and FUN sewing to you all! P.S. I've purchased one of Vogue dress patterns today. I'm so excited and also a bit scared, because I've never used Vogue patterns except one jersey top. I have completely no idea how this project turns out. Wish me luck! This is a response to the enquiries from Rebecca and Shams in the last post. -How the supporting tape look? This is what I called "the supporting tape". It is called "woolly spin tape" in Japan. It's a elastic soft tape that is actually braided bundle of "woolly" fine elastic threads, I guess. I overlocked the edge of the neckline, inserting the tape under the stitches on the wrong side of fabric. Then I folded the edge in and stitched straight from the front. -What is the advantage of "split sleeve"? 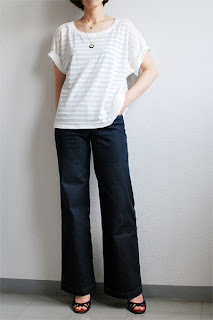 I still don't know how you call this type of sleeves in English, but I think I can explain what I like about them. I like split sleeves because (1) they are comfortable as much as raglan sleeves are yet they look less sporty. Also, (2) they are quite magnanimous to hobby sewists. I prefer the appearance of set-in sleeves because they look less sporty than those raglan sleeves would usually do (from the front, of course). I have no problem with wearing raglan sleeves when I play sports because they are comfortable, but they tend to look too casual on me most of the time. Split sleeves are one of good solutions, imho. Also, I think they are easy to fit when talking about sewing. Set-in sleeves need the right shoulder point to achieve a neat look, but split sleeves allow narrower shoulders as well as broader shoulders and stretchy fabrics as well as less stretchy fabrics to use the same pattern to fit wearers, because of their rounded shoulder seam. Easy fit. Not loose fit. I do like it. I've taken some pictures to complement my writing. I hope you can imagine what I told about it. P.S. I definitely need iron-on hemming tapes or a stick glue, for basting, to sew this curved shoulders neatly. I decided to sew cardigans for myself. You might remember that I can't live without them. Though I used to avoid sewing jerseys, I've been happily playing with my serger for some time and now I feel that finally it's the time for my essential, Cardigans. I'd love to own my handmade half- or shorter-sleeved cardigans in different colors. I also hope them simple, clean-cut, compact, and very&rightly fitted. 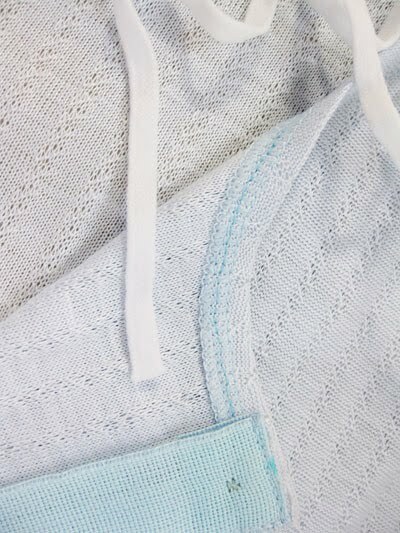 So, last weekend, I examined if I could adopt one of pullover patterns which I already had, for making fitted cardigans. I could buy any cardigan pattern for my project, but luckily I remembered that Miho once mentioned that it could be more than easy to use a pullover pattern for making close fitted cardigans. Although sizing has to be considered carefully, it should be basically achieved by just adding front opening. I used a pattern named Fujiko (one of Japanese female names) from TAMANEGI-KOBO and sewed two almost identical compact cardigans. I cut the sleeves and bodice to make them shorter, and made front plackets for the buttons. 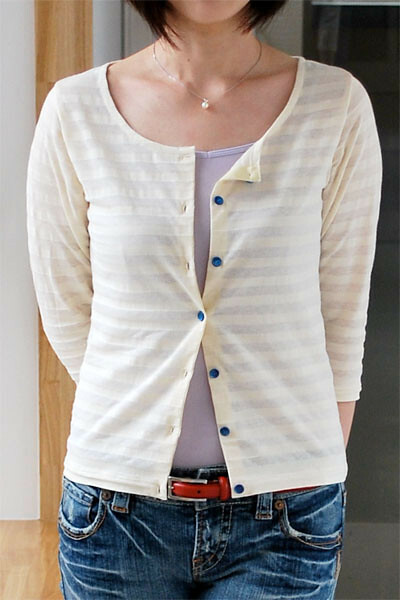 The white cardigan has an wider neckline and 6/10 sleeves. 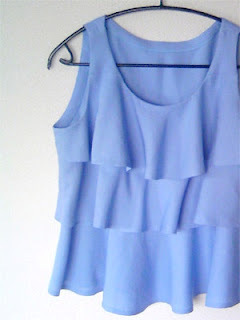 The ice-blue one has shorter sleeves and shorter bodice with narrower neckline. Both were sewed in size M, which was my usual pullover size, and they nicely fit me. I put grosgrain ribbons on the back of front plackets to make them sturdy. 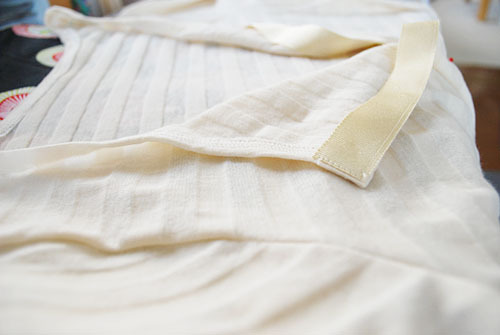 I also inserted supporting tape around the neckline by overlocking, for the same reason with placket ribbon. They are all working brilliant. I think I had a good start! If I find some lacy breezy summery light fabric that would make a pretty cardi next time, I don't think I can leave without buying it...someone living in my head is always shouting at me that I shouldn't buy any more of fabrics, though! JUST A NOTE: Pattern Fujiko has an unusual sleeve/shoulder construction. 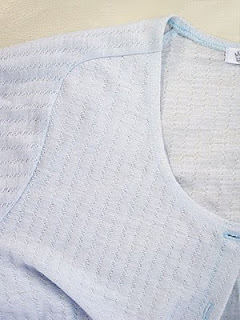 The garment looks like having a pair of set-in sleeves from the front, but actually it looks like a raglan sleeved from the back. We call this style "split sleeve" in Japanese, but I don't think you do the same in English...I couldn't find the corresponding word in my dictionaries. Anyways, I recommend you to refer the technical drawing and some photographs if you don't get it with my description on the sleeves. I once used a pattern for tank top with rows of ruffles, with a blue light woven rayon, probably last summer. The result was no good on me. It was OK because the garment was made for my acquaintance but not mine. Technically, the tank top and those ruffles were pretty itself, and same as on the real owner. They weren't OK on me (I was allowed to put it on as I had to check my sewing). They looked excessive and I looked some strange and shabby round marine creature, if I have to explain. Ruffles look just too bulky on a certain kind of people, there are others who are highlighted their beauty by those flutterings around body, though. On the last weekend, I found this white rayon jersey in my stash and I suddenly got an idea. I thought that I might be able to sew my wearable ruffles with the same pattern, if I made them in jersey. The ruffles might look less excessive. Jersey might help me, the pattern was made for woven fabrics though. I was fairly sure of it. So I checked. I omitted a side zipper and pinched an inch at both sides from the tank. I used a light silk/cotton for the upper back bodice. Because I didn't take pictures of the first one on me, I know you can't tell differences anyway. However I can tell you that I think it's OK this time. What do you think? Jersey has made the ruffles less empowered and I feel I'm in control. cool! I recommend you to give a thought on jerseys if you have the same kind of bitter memories on your ruffle patterns. Brigitte is the name of my favorite pattern for dress. I think I've mentioned it before. And, I made a Brigitte dress again! I like sewing my garments from my favorite patterns. Of course it sounds nothing but reasonable, because there wouldn't be anybody who loves using the patterns that she/he hates! However, what I'd love to bring here is that I am very comfortable with using particular patterns for multiple, multiple, and multiple times and shamelessly fond of putting on those cloned clothes. She tortures you with the same stories and the same patterns. It doesn't help you a bit that the dress pattern is Japanese. Happy sewing to you all! I have each photo in my Flickr album, with brief description for me-made garment. My outfit recording May, which was inspired by Zoe 's Me-Made-May project, is over. Though I can say that I tried very hard for a satisfying achievement, here I have some blank spaces in the picture, which means that I failed in recording my outfit due to an overflowing work and my ill time-managing. I had a certain presentation on 24th at work and was just too nervous to consider anything else until I could successfully finish my last slide. I was a bit sad about the blank spaces, but now I admit it's all about current me including the incompletion of this project. Well, I've certainly learnt a LOT from my version of Me-Made-May. Thank you, Zoe! 1) I tried to put on as many me-made garments as possible in this project. I tried to avoid the garments if they were worn once in this period. I also chose only what I wanted to wear, so the garments that were in season but weren't chosen have to go for good. By trying as many of them as possible, I found more way of matching my clothes too. That was a hit. 2) I had a stupid image of myself before, that is, until this project started I worried if I was generally dressing too clamorous, but I found that it was not so true, at least not much more than I imagined. It made me happy! 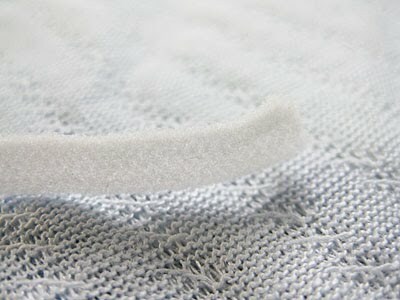 Because there is no big worry any more, I feel comfortable with my own sewing and future projects, which is really cool. Now I am hoping we'll have fabulous June!